Former Strikeforce 135lb women’s champion Sarah Kaufman will get back in action on July 22 at Strikeforce Challengers against Liz Carmouche. The bout was confirmed to MMAWeekly.com by sources close to the match-up with at least one of the fighters putting pen to paper on a bout agreement. MMAFighting.com initially reported the bout. Kaufman (13-1) will return to Strikeforce for the first time since losing her welterweight title to current champion Marloes Coenen in October 2010. The Canadian fighter went on to compete in a promotion outside of Strikeforce for a single fight, picking up a win over Megumi Yabushita in early April. Now she will look to get back in the title hunt with another fighter hoping to do the same. As a late replacement for Miesha Tate at a Strikeforce event in March, Liz Carmouche (5-1) gave the champion Marloes Coenen everything she could handle. Carmouche was on point and dominant for much of the fight, but a mistake in the 4th round found her on the wrong end of a triangle choke from the champion. Carmouche was submitted, but definitely earned the respect of Coenen that night. Now she will try to earn another shot at the title when she faces a former champion in Kaufman. 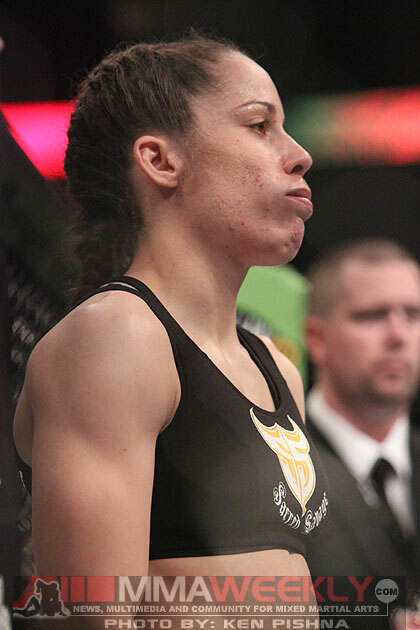 The bout between Kaufman and Carmouche will take place at a July 22 Strikeforce Challengers card expected to go down in Las Vegas in the Pearl at the Palms Hotel & Casino.